Once again, I can never read just one book at a time! Does anyone else do this or are you a monogamous reader? Somehow I manage to keep all the plot lines straight. 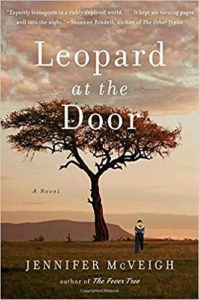 LEOPARD AT THE DOOR by Jennifer McVeigh was one recommended to me by my mother, once again proving the point that you should always listen to your mother! This book instantly swept me away into a faraway place and a long ago time. Young Rachel returns to her beloved Kenya after being exiled to England for many years. Upon her arrival, Rachel realizes that the farm, home and country she loved is nearly unrecognizable. 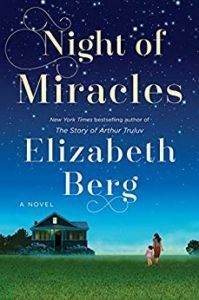 ARTHUR TRULUV comes NIGHT OF MIRACLES. Lucille Howard may be getting on in years, but she keeps busy. After the loss of a dear friend, Lucille has started to teach baking classes and the arrival of some new neighbors brings a tragedy and newfound friendships. Now I can’t wait for Ms. Berg’s next one! Please write faster! in the No. 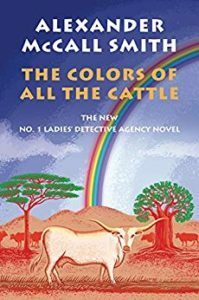 1 Ladies’ Detective Agency series has all the elements that I look forward to while reading about Precious Ramotswe and her family and friends: wit, beautiful prose and an enthralling story. 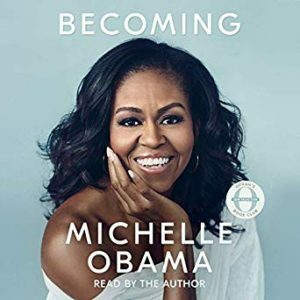 As I tend to be on the road quite a bit, I while away the time by listening to audio books and I chose Michelle Obama’s BECOMING MICHELLE. Read by the former First Lady, this memoir is just what I needed. Poignant, funny and honest, the story of Michelle Obama and her journey is a balm during tumultuous times. If four books aren’t enough to have going at once,I always have a book ready to go on my e-reader. 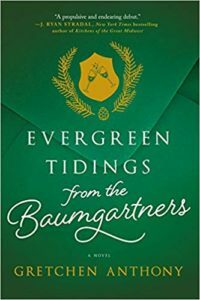 Befitting of the season, I’m reading EVERGREEN TIDINGS FROM THE BAUMGARTNERS by Gretchen Anthony. Violet Baumgartner plans a perfect retirement party for her husband but disaster strikes when in front of two hundred guests, Violet learns her daughter has been keeping a very big secret that threatens to derail the holidays and Violet’s perfectly constructed world. What’s on your bedside table these days?